THIS ITEM IS NOT AVAILABLE AT PRESENT. WE WILL NOT BE GETTING ANYMORE Star Wars Taikoyaku Stormtrooper Meisho Movie Realization Action Figure. From the Star Wars collection by Bandai Tamashii Nations. 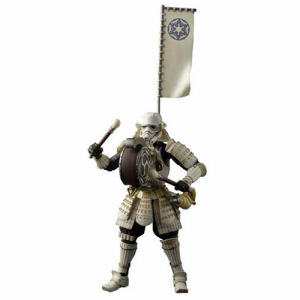 Star Wars Taikoyaku Stormtrooper Meisho Movie Realization Action Figure. The set includes 4 interchangeable hands - 2 drum sticks - a conch shel - flag set. Measures 7 inches tall. Bandai Tamashii Nations Star Wars Actionfigures shipping from Canada. No Surprise Border fees or Customs!